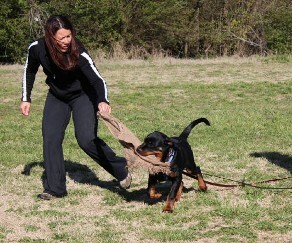 Rottweiler Schutzhund dogs have high drive and endurance. Schutzhund (German for protection dog), Germany developed Schutzhund ( dog sport ) in the early 1900s to test whether the German Dogs exhibit the traits necessary for police-type work. 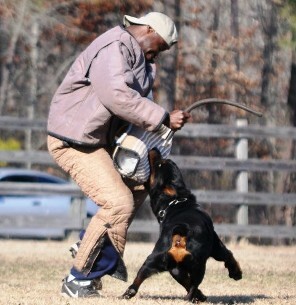 Today, many breeds such as Rottweilers, German shepherds, Giant Schnauzer, Hovawort, Malinois, and Boxer to name a few, compete in Schutzhund, it is a demanding test and sport for any dog. Very few are able to pass successfully. Schutzhund tests dogs of all breeds for the traits necessary for police-type work. Schutzhund tests allows the dogs to be eligible for police work, specific odor detection, search and rescue, and many others. Schutzhund tests for certain traits. There are three schutzhund titles: Schutzhund 1 (SchH1), Schutzhund 2 (SchH2), and Schutzhund 3 (SchH3). Before a dog can compete for a SchH1, the dog must pass a temperament test called a B or BH (Begleithundprüfung, which translates as "traffic-sure companion dog test"). The B tests basic obedience and sureness around strange people, strange dogs, traffic, and loud noises. A dog cannt compete in Schutzhund if it exhibits excessive fear, distractibility, or aggression. Tracking The tracking phase tests not only the dogs scenting ability, but also its mental soundness and physical endurance. In the tracking phase, a track layer walks across a field, dropping several small articles along the way. After a period of time, the dog is directed to follow the track while being followed by the handler on a 33 foot leash. When the dog finds each article he indicates it, usually by lying down with the article between his front paws. The dog is scored on how intently and carefully he follows the track and indicates the articles. The length, complexity, number of articles, and age of the track varies for each title. Obedience The obedience phase is done in a large field, with the dogs working in pairs. One dog is placed in a down position on the side of the field and his handler leaves him while the other dog works in the field. Then the dogs switch places. In the field, there are several heeling exercises, including heeling through a group of people. There are two or three gunshots during the heeling to test the dog's reaction to loud noises. There are one or two recalls, three retrieves (flat, jump and A-frame), and a send out where the dog is directed to run away from the handler straight and fast and then lie down on command. Obedience is judged on the dog's accuracy and attitude. The dog must show enthusiasm. A dog that is uninterested or cowering scores poorly. Protection In the protection phase, the judge has an assistant, called the "decoy", who helps him test the dog's courage to protect himself and his handler and his ability to be controlled while doing so. The decoy wears a heavily padded sleeve on one arm. There are several blinds, placed where the decoy can hide, on the field. The dog is directed to search the blinds for the decoy. When he finds the decoy, he indicates this by barking. The dog must guard the decoy to prevent him from moving until recalled by his handler. There follows a series of exercises similar to police work where the handler searches the decoy and transports him to the judge. At specified points, the decoy either attacks the dog or the handler or attempts to escape. The dog must stop the attack or the escape by biting the padded sleeve. When the attack or escape stops, the dog is commanded to "out," or release the sleeve. The dog must out or he is dismissed. At all times the dog must show the courage to engage the decoy and the temperament to obey his handler while in this high state of drive. Again, the dog must show enthusiasm. A dog that shows fear, lack of control, or inappropriate aggression is dismissed. 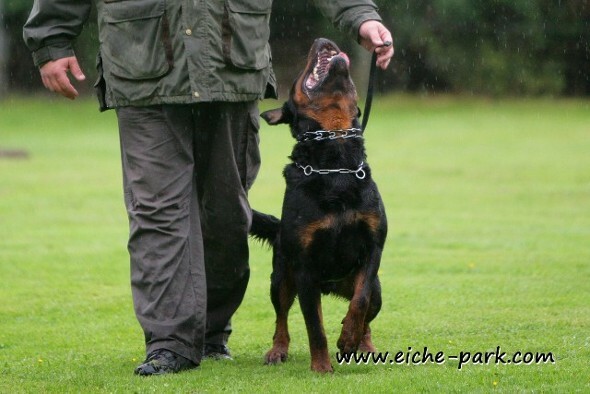 The Picture is ADRK Quantos vom Oberhausener Norden, a excellent working dog in Germany. Quantos has earned his VPG III and Gekort. He is owned by Rottweiler breeder Joseph Focking. We do not own this excellent Rottweiler, the photograph is a reference only. You can view more random Schutzhund videos on youtube. AKC pedigrees do not show German titles.